Taylor hails Davies as one of the "greatest ever"
ESPNscrum columnist John Taylor has paid an emotional tribute to his former Wales and British & Irish Lions team-mate Mervyn Davies, who has died aged 65. The Welsh Rugby Union announced earlier today that Davies had lost a long battle with cancer and the tributes have since poured in for a player known worldwide as 'Merv the Swerv'. The former Wales captain was a key figure during a golden era for Welsh rugby and also served the British & Irish Lions with distinction throughout a 46-Test career. Taylor featured alongside Davies for much of his career whether for London Welsh, Wales or the Lions and has revealed details of a final emotional meeting with his good friend. "We talked on Wednesday about the upcoming Grand Slam match," said Taylor, referring to Wales' showdown with France on Saturday that could set the seal on a third Six Nations clean sweep in eight seasons. "I said that they look pretty good and he said, 'Yep, they're pretty good but I don't think they can say they are as good as we were - yet' and he stressed the 'yet' with a little smile and twinkle as if to say they also look pretty damn good to me too. I think that was a nice touch." Revealing how their paths first crossed, Taylor added: "He was teaching down in Guildford and he played a few games down there I think before gravitating to Old Deer Park where he first came onto my radar at a selection meeting. We were talking about the lack of lineout ball in the first team and the second team captain Glan Richards said he had got this guy who would win us some lineout ball but not much else - and that was Merv. Two weeks later he was in the London Welsh first team and three months later he made his debut for Wales in the Five nations and was never to be dropped." Taylor also credits Davies with a steadying hand just as Wales' golden generation were finding their feet. 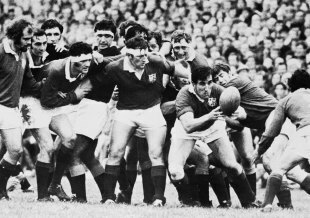 "At the start of the 1969 Five Nations, many of the new generation had all been capped already including the likes of Gareth [Edwards], Gerald [Davies] and Barry [John]. But we had really stuttered - that was until the two missing bits of the jigsaw emerged with JPR at fullback and Merv at No.8. That season we won a Triple Crown and that was the start of the great era. He was a very, very significant factor in that because he provided that ball-winning ability." 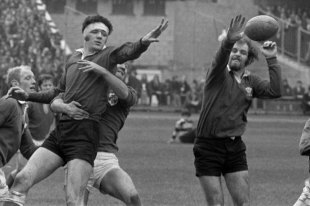 Both Taylor and Davies were among those to cement their reputations during the Lions' historic series victory over the All Blacks in 1971 - the only Lions side to have achieved that feat. Davies would also go on to star for the elite tourists four years later when they went unbeaten in South Africa. "Merv won his spurs in the southern hemisphere and earned enormous respect from New Zealand and South Africa," recalled Taylor. "He was a very hard man by that time, an old fashioned grafter who did the business at the coalface rather than a flash No.8. He won you ball in all the dark areas and he had these telescopic arms. His tackling ability was phenomenal. Just when you thought someone was through then he would reach out and drag them back." His achievements in the red of Wales and the Lions make him a very special player according to Taylor. "He is also part of a very elite group - the elite of the elite - whose members you can probably count on just one hand. Players who played in all eight tests in the victorious Lions tours of '71 and '74. There's him, Willie-John [McBride], Gareth [Edwards], JPR [Williams] (and Ian McLauchlan)." As for his all-time standing? Taylor believes few have come close to matching him as a player. "I think the only people throughout my time who you might have said could touch him were Scott Quinnell and Alan Pask - but to me he was the greatest ever Welsh No.8 and since the 60s, the only person who I would put near him would be Brian Lochore, the great All Blacks captain from the 1960s who was also a magnificent No.8."